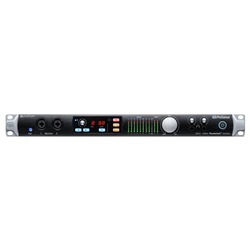 The PreSonus Quantum Thunderbolt Audio Interface is a 26x32 thunderbolt 2 ultra-low-latency audio interface. The PreSonus Quantum Thunderbolt Audio Interface is a 26x32 thunderbolt 2 ultra-low-latency audio interface. 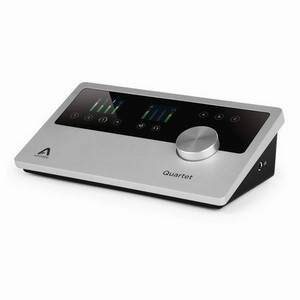 The Quantum Thunderbolt Audio Interface includes two combo mic/line/instrument inputs and six combo mic/line inputs, with each mic input featuring a digital-controlled XMAX preamp. The versatile design allows you to daisy-chain multiple units to expand your I/O up to 96 in and out connections. The PreSonus Quantum features a wide range of analog and digital connectivity making it one of the most comprehensive high-end interfaces on the market. 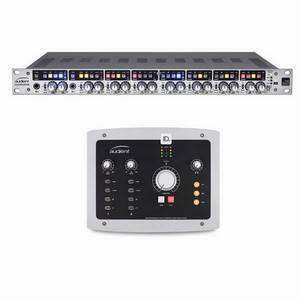 The interface also operates up to 192kHz for ultra-high-definition mixing and recording. 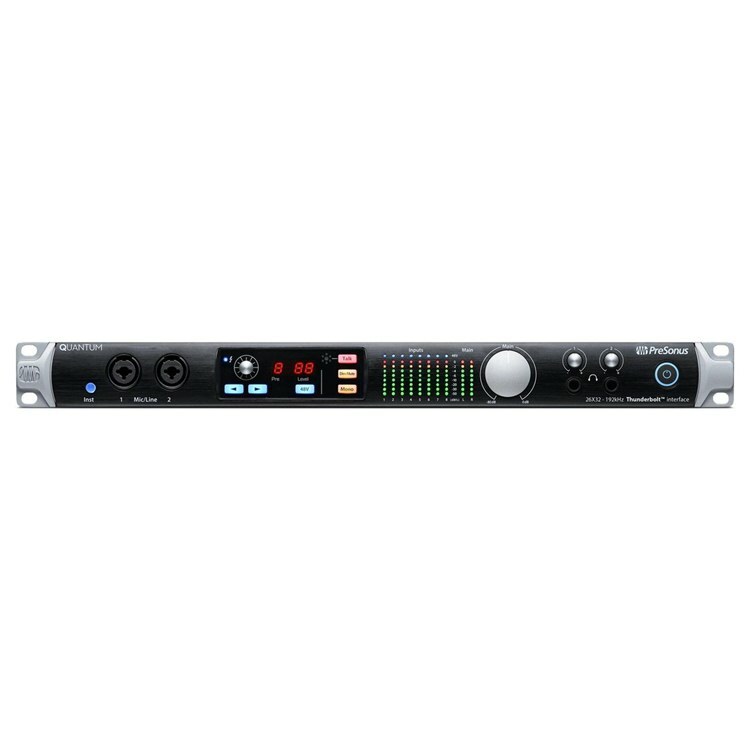 The PreSonus Quantum Thunderbolt is a high-end Thunderbolt 2 audio interface boasting ultra-low-latency performance and a wide range of connectivity. The PreSonus Quantum is redefining the audio interface world thanks to its affordable price range and wide range of premium-grade components and technology. The high-speed Thunderbolt 2 interface boasts up to 26 inputs and 32 outputs. The wide range of analog and digital connectivity means the Quantum can handle most recording and processing applications. The inputs consist of two combo mic/line/instrument inputs and six combo mic/line inputs, with a digitally-controlled XMAX preamp and individual +48V Phantom Power on each channels. Also included is two ¼-inch TRS main outputs, eight ¼-inch TRS aux outputs and two independent headphone outputs. The high-definition audio performance is thanks to the audiophile-grade digital converters. Combined with the low-jitter clocking and recallable preamps, the Quantum delivers a recording experience like no other. The Quantum boasts a sample rate and audio resolution ranging up to 192kHz for high-definition mixing and recording capabilities. The premium-grade converters provide 120dB of dynamic range, capturing all the detail and natural harmonics, with no distortion. The high-class XMAX analog microphone preamps provide extremely high headroom, with a rich overall sound. One of the most unique features of the Quantum interface is the ability to daisy-chain multiple units together to expand your connectivity options. You can link up to four Quantum interfaces via Thunderbolt, to gain access to up to 96 in and out connections. The BNC word clock I/O is designed to deliver tight synchronisation between digital audio devices. The Quantum audio interface is easily integrated with PreSonus’ Studio One professional audio software. This opens up a new world of control, allowing you to fully integrate with the powerful software to control every aspect of your hardware. Once in Studio One, you can find full preamp control. You can also control your preamp levels wirelessly with the use of the free UC surface touch-control software. The road-rugged construction is built-to-last with its all-metal chassis and metal knobs, making it ideal for studio and live applications alike. The robust design is rack-mountable, taking up only a single unit of space in a studio rack. The front-panel gives you access to the two main mic/line inputs, and the main display gives you information on which preamp is use as well as the levels. There is also ten, 8-segment LED meters that provide precise visual monitoring for all your inputs. There is also a Talkback switch and internal Talkback microphone so you can communicate with artists while you are recording. The large volume potentiometer gives you precise control over your master levels, with dual headphone outputs located to the right hand side for private monitoring.